The Pentagon is buying Chevrolet Volts to help "green up" the military—while propping up sales of the bailed-out automaker’s most politicized car. The Department of Defense began purchasing the struggling luxury electric car, which retails at $40,000, this summer as part of its goal to purchase 1,500 such green vehicles. The Marine Corps Air Station in Miramar, Calif. purchased its first two Volts in July, and 18 more vehicles will come shortly to Joint Base Andrews in Maryland, where Air Force One is based, according to military magazine Stars and Stripes. 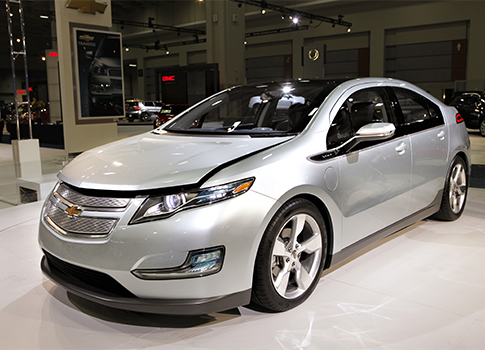 The Obama administration championed the production of the Volt. Along with the president’s pledge this year to "buy one and drive it myself … five years from now when I’m not president anymore," the government offers a $7,500 tax break to encourage sales. Such perks, however, have failed to drive consumers to GM car lots. The vehicle has been forced to suspend production twice this year after the Volt failed to gain a foothold in the marketplace. GM is now offering the vehicle for as low as $169 per month, a financing deal that is generally reserved for $15,000 cars—a price so low that GM is reportedly losing nearly $50,000 per vehicle. The struggling automaker will again suspend production later this month after only 2,500 Volts drove off the lots last month. GM has spent $1.2 billion developing the electric car and is still working out kinks, such as the Volt’s tendency to electrocute firefighters and first responders to accidents. The Department of Defense has been involved in that process, helping to test the Volt’s battery safety and capabilities. Obama has made the auto bailout a centerpiece on the campaign trail despite GM’s recent woes. The company’s stock has fallen about 40 percent since it emerged from bankruptcy. GM and its lending arm, Ally Bank, owe $42 billion on their $57 billion bailout. The government still has a stake in GM. The Pentagon’s massive car-buying scheme is the latest example of government trying to help GM raise its sales volumes. The General Services Administration of Las Vegas fame purchased 100 Volts in 2011 for various agencies. This entry was posted in National Security, Politics and tagged Auto Industry, Barack Obama, Department of Defense, General Motors, Green Energy, Media, Military, Obama Administration, Pentagon. Bookmark the permalink.